As mentioned earlier this week, I used the leftovers from my Hoisin Orange Roasted Whole Chicken to create a delicious dinner salad for the next night. I used the left-over cooked chicken, the left-over hoisin bacon and the roasted clementines. But don’t worry. 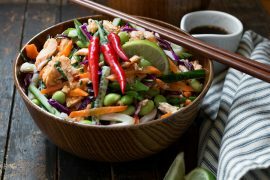 If you don’t want to make the Hoisin Orange Chicken, you can make this salad just as easily starting with cooked chicken from a rotisserie chicken. 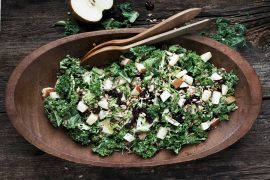 Add in a few slices of cooked bacon, the fruit, nuts and seeds and you’re good to go! This salad was made from the leftovers from this Hoisin Orange Roasted Whole Chicken. It’s always great to get two meals from one cook, but you can also make this one from scratch starting with a rotisserie chicken instead. I absolutely loved the salad dressing on this one. Full of orange flavour, with a hint of soy sauce, it also is an oil-free salad dressing, which was such a nice change. As mentioned above, if you don’t have left-over roast chicken already, pick up a rotisserie chicken and use the chicken from that. This salad is a bit of a kitchen sink salad. I added raspberries from the fridge and walnuts from the pantry. Any fresh or dried fruit (dried cranberries would be great! ), nuts and seeds would be great. I used goat cheese here, but feta would be nice, or skip the cheese altogether for a dairy free salad. If you are starting with the left-over roasted clementines from the whole roast chicken, you probably won’t get a ton of juice out of them. I juiced what I could, then topped up with freshly squeeze orange juice. Since it’s citrus season, I had lots of fresh oranges to use in my salad. Canned mandarin oranges would be a great option anytime, as well. Unfortunately, we can’t just chop up fresh orange to add to salads. There’s all that bitter pith and those pesky membranes that we’d rather not eat with our salad. So when it comes to oranges, we need to “supreme” them. It’s a fancy term, but what it means is that we want to cut the orange segments out, while leaving the bitter, white pith behind. To supreme and orange, use a sharp knife to cut away the peel and white pith layer, just exposing the fruit. Then, carefully cut a v-shaped cut between the thin white membrane that separates the orange segments, to create a lovely chunk of orange with no nasty stuff. 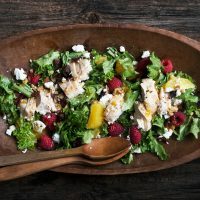 Starting with pre-cooked chicken (left-over or start with a rotisserie chicken) makes this healthy and flavourful dinner salad super easy. 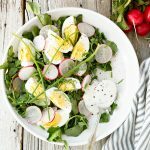 Prepare salad dressing by combining all ingredients in a small bowl or jar. Whisk or shake to combine. Set aside. Line a salad bowl with the chopped lettuce. 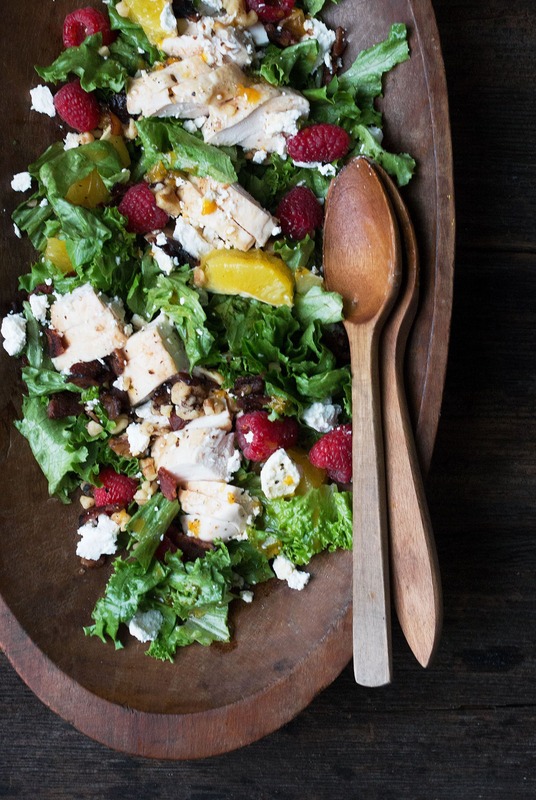 Top with chicken, bacon, raspberries, oranges, walnuts and goat cheese crumbles. Drizzle with salad dressing. Toss to coat. Enjoy! Notes: I used the leftover roasted chicken, the hoisin bacon and the roasted oranges from my Hoisin Orange Roasted Whole Chicken. It's a great way to cook once and enjoy two great meals! 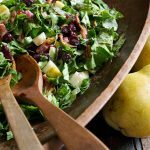 Perfect for any time of year when fresh pears are available! This one is also great any time of year! Full of fruit, seeds and great greens. 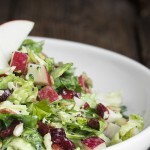 One of my favourite salads for lunch or a light dinner. Great post Jennifer!! 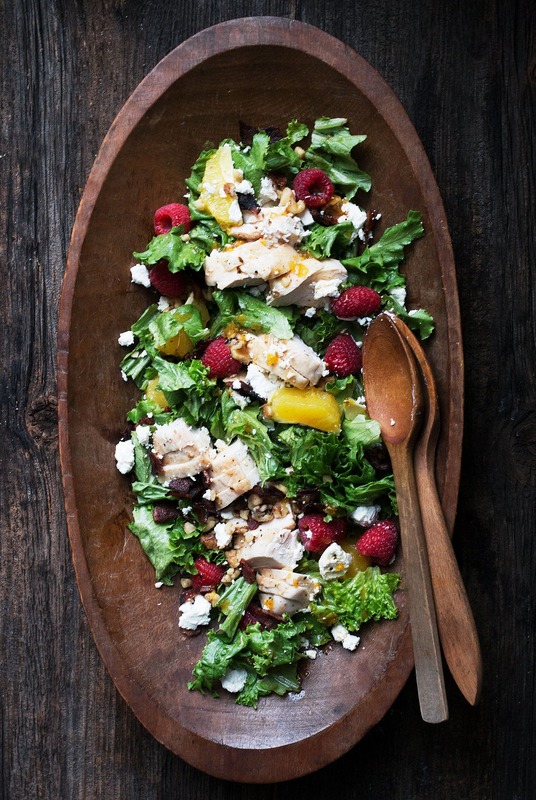 Love the easy citrus dressing without the olive oil – sounds fabulous!! Thanks so much, Anna! The dressing was such a nice change from the usual. So light and fresh! Thanks Laura and yes, a perfect lunch salad! 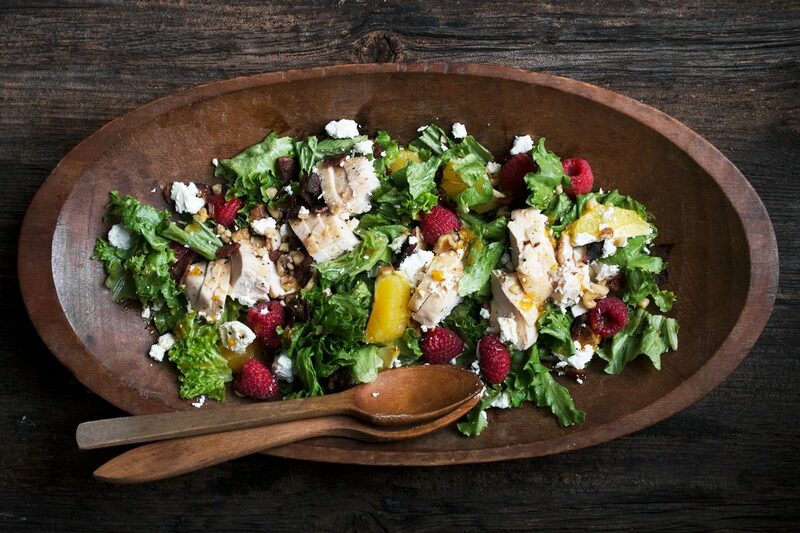 I wonder if I could ‘doctor up’ some rotisserie chicken with those flavors for this salad, it looks amazing! Thanks Sue and yes, rotisserie chicken would work nicely as well! 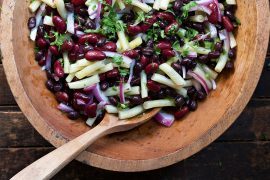 This salad is gorgeous Jennifer! What a treat, any time of year but I really nice refreshing respite now with so many heavy comfort foods everywhere. This is my kind of dinner salad Jennifer. Love the oranges and bet that leftover orange Hoisin chicken is fantastic in this. Have a great weekend and thanks for the beautiful inspiration!